An Operational Amplifier is basically a three-terminal device which consists of two high impedance inputs, one called the Inverting Input given by a negative sign, ( - ) and the other one called the Non Inverting Input given by a positive sign ( + ). A non-inverting summing amplifier can be constructed using the non-inverting amplifier configuration. The input voltages are applied to the non-inverting input terminal and a part of the output is fed back to the inverting input terminal, through voltage-divider-bias feedback. 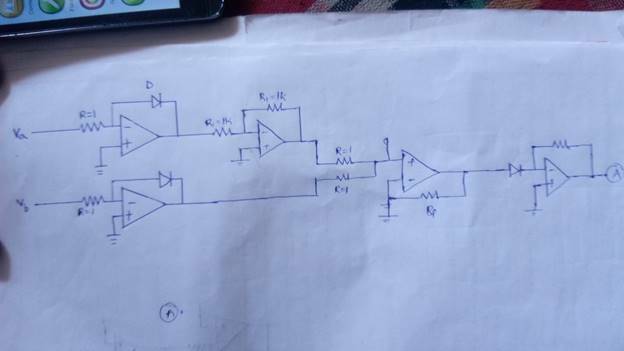 For design of the non inverting summing circuit we have to first design the non invering amplifier which should have the required high voltage gain. After we have to select the Input resistors as large as possible according to the opamp which we are using. Log amplifier is a linear circuit in which the output voltage will be a constant times the natural logarithm of the input. It is basically used to provide Dynamic Compression range. 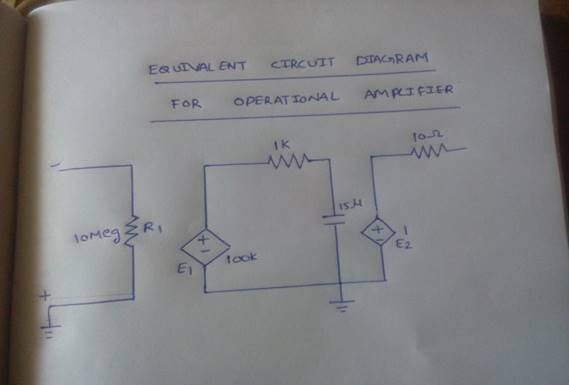 Anti logarithmic amplifier is an amplifier which provides output proportional to the anti log i.e. exponential to the input voltage. Hence V0 = -I0*R*(exp (Vin/Vt)). First when the input is applied to inverting terminal of logarithmic amplifier we will get -ln(Va) .Similarly at other input we will get -ln(Vb).And when -ln(Va) is applied to inverting Input of Inverting amplifier we will get ln(Va). Then both Inputs ln(Va) and -ln(Vb) are given input to non inverting summing amplifier.Therefore we will get ln(Va)-ln(Vb) which is ln(Va/Vb) and again if this is given to inverting terminal of antilogarithmic amplifier we will get (Va/Vb) .This is our desired Output. 3) The Output Waveforms are observed for every respective amplifier and are also verified.